The Susie & Sam series is a charming collection of illustrated stories about the new events and first experiences that most young children will encounter in everyday life. 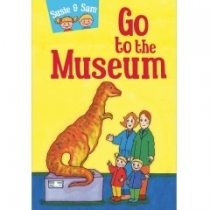 In Susie & Sam Go to the Museum the twins go the museum with their mum and dad. Sam is worried the museum will be boring. When the family get there, Susie and Sam love the dinosaurs, and animals, costumes, model steam engines, vases from ancient Rome and mummies from Egypt. They also look at some musical instruments. The story is presented in a helpful, positive and reassuring way with bright, fun pictures.